Every year I get really excited for legging weather. When I can finally whip out my favorite legging and wear them on repeat without any shame. I think most girls would agree that a great pair of functional leggings completes any fall wardrobe. Comfort and flexibility being at the top of the list. So now you can meet mine: The Runway Legging by True Religion. I snagged these at the True Religion store in the Galleria and I’m in major like so far! I really love how they hug every inch of my body elongating my legs. It’s kin-dove like a magic trick! Any of my shorter friends out there can totally appreciate that also! Plus they are stretchy enough but also hold you in at all the right places. Wink, wink. The all over leather look of this legging makes for a perfect dressed up look, but today a wanted to show how versatile they can be and opted for a more casual look. Alex said I looked like a New Yorker in this outfit, so I took it as a major complement! LOL! Boys! Thank you to True Religion for sponsoring this post. All opinions are my own. Tiffany, this is such a cozy but still fashionable look! Simple tweaks can elevate something casual so well. Thank you for sharing and have a wonderful day! Those leggings look perfect!! A little edgy too, I love it! Such a cute, casual yet cool outfit. Love it! Love this look! The perfect legging is definitely an essential – these look amazing! such a nice casual look! 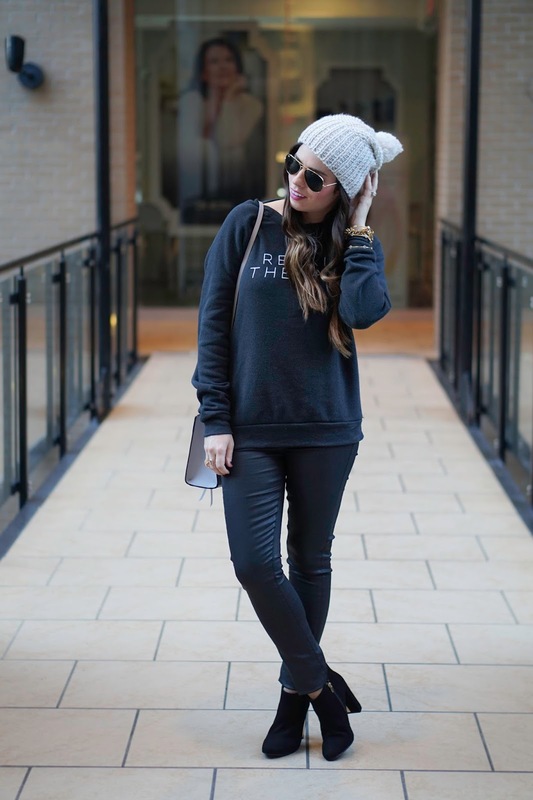 love the beanie and the boots! love love the look!! your bag is so pretty.. PERFECT this almost all black! !